This has become a family staple at New Year's. It's a lovely east-west blend that we reckon is quite reflective of our own mixed origins. But that's secondary. 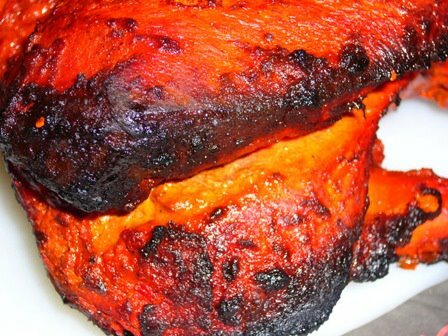 More important is of course that tandoori seems to suit this bird really well. Gone are the days of waiting with bated breath for some brave soul to taste the roast and declare that no, this one time the turkey wasn't dry. The meat is moist, and dare I say, juicy even, and though the spices aren't as rich and distinct as others I've tried, it still is good tandoori. This definitely comes with a "eat now or forever hold your peace" tag on our buffet line. I certainly agree with the assessment of the tandoori turkey and so, unfortunately for me, did 100 others on New Year's day, so that when I went up to the buffet table all the turkey was gone. Sob! Next year I am going to snaffle some while the turkey is being carved so blinkingredlight had better be quick too.